The 18-chair Munson Dialysis Center is unique in offering many additional services not available at other dialysis centers across the country. These include a pharmacist and a Patient Advisory Committee. As part of Munson Healthcare, many other services can be coordinated as needed. Munson Dialysis Center received a 5-star quality rating from Medicare in 2017. The recognition reflects implementation of best-practice standards for patient safety and care. The Kalkaska Dialysis Center is adjacent to Kalkaska Memorial Health Center in a modern, airy, healing environment. The 12-station dialysis center was recognized in 2016 by the End Stage Renal Disease Network 11 for achieving 5-diamond status and also achieved 5-star Medicare rating in 2016 and a 4-star rating in 2017. The recognition reflects implementation of best-practice standards for patient safety and care. Opened in 2015, the state-of-the-art Elizabeth C. Hosick Dialysis Center places a high value on patient comfort. 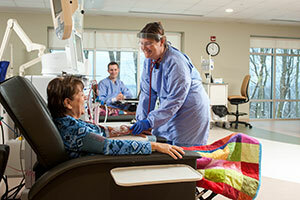 The 10 dialysis chairs are heated and feature screens for patients to watch television. Floor-to-ceiling windows provide beautiful scenic views of Lake Michigan. This 10-chair center received a 5-star quality rating from Medicare in 2017. The recognition reflects implementation of best-practice standards for patient safety and care. As a dialysis patient, you will be invited to meet with several members of the renal team. These meetings are designed to give you information about kidney function, disease treatment options, diets, and life with dialysis. The dialysis staff will provide information and answer your questions. This information will help you adjust to your illness and select an appropriate treatment option.